This article is meant to provide you with an overview of staff training and documentation in extendedReach. 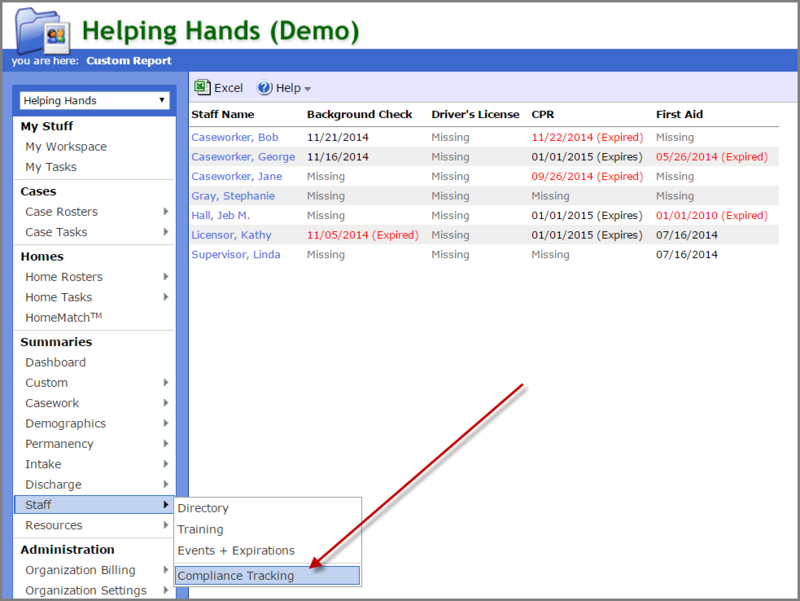 extendedReach provides you with the ability to create a custom “Compliance” checklist, which ensures your staff are meeting training and documentation requirements. You must be an Agency Administrator to access this checklist which appears on the “Staff” screen on the “Compliance Tab”. 1. Go to the Organization Preferences screen. 2. Click the “Keywords” tab and then click the “Staff” sub-tab. Type the document name (one per line) you wish to track on the checklist in the “Staff Documents (Mandated)”. Type training topics (one per line) you wish to track on the checklist in the “Staff Training (Mandated)”. You can add other commonly used document title and training topics in the respective “(Other)” list boxes. (You can always add miscellaneous documents and training topics during data entry – so you don’t need to make this an exhaustive list). 4. Click “Save” to save the document and training lists. Go to the Staff Directory and click on the name of any of your staff. Click the “Add Document” button. Select the document “Title” or click the green “+” icon to add a new type. 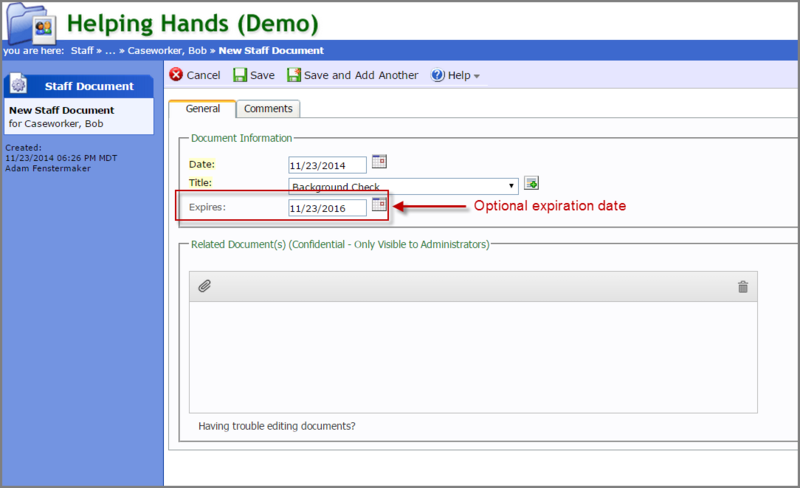 If the document expires, type in the expiration date (otherwise leave the “Expires” date blank. If you wish to add an attachment to the document screen, click the paperclip icon to attach the file. Only Administrators and Restricted Staff Administrators can access attachments on the Document screen. The saved document will appear on the “Documents” tab. 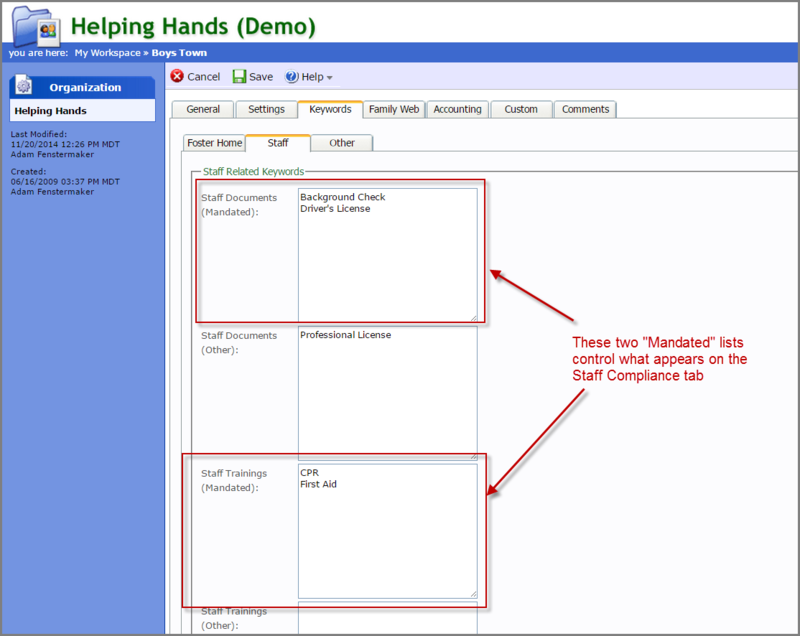 If the saved document title appears on the “Mandated” list it will also appear on the “Compliance” tab. Click the “Add Training” button. Select the training “Topic” or click the green “+” icon to add a new type. 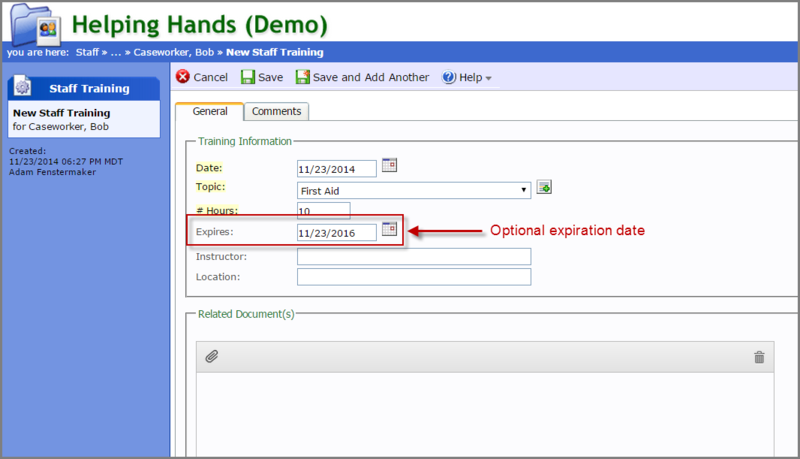 If the training expires, type in the expiration date (otherwise leave the “Expires” date blank. If you wish to add an attachment to the document screen, click the paperclip icon to attach the file. The saved training will appear on the “Training” tab. If the saved training topic appears on the “Mandated” list it will also appear on the “Compliance” tab. Click the “Compliance Tracking” option on the side menu. This list is exportable to Microsoft Excel. Staff can learn more about Compliance Checklists with these articles and videos: Case Screen: Compliance Tab.